If the body of your grill is in good shape, there is no need to replace it. Fix it instead. This will be cheaper and allow you to keep the grill you love and have invested in. The cost of a new three-burner Weber gas grill is about $500, but it can be revamped to like-new condition for about $100.The insides or guts of a propane or gas grill are fairly simple and easily replaced. Revamp your gas grill to make it work like new. Turn off the propane tank and remove it from the grill. Remove the old grill grates, igniter and burner tubes. The grill grates can be easily pulled out. The igniter will need to be unscrewed from the front of the grill and the igniter wire will be attached with a bolt. Unscrew all parts and remove the entire igniter assembly. The hardware for the burner tubes will need to be unscrewed and pulled from the inside of the grill. Clean the inside of the grill with a wire brush. Remove all of the rust and residue. You may need to use a degreaser to remove all of the residue. 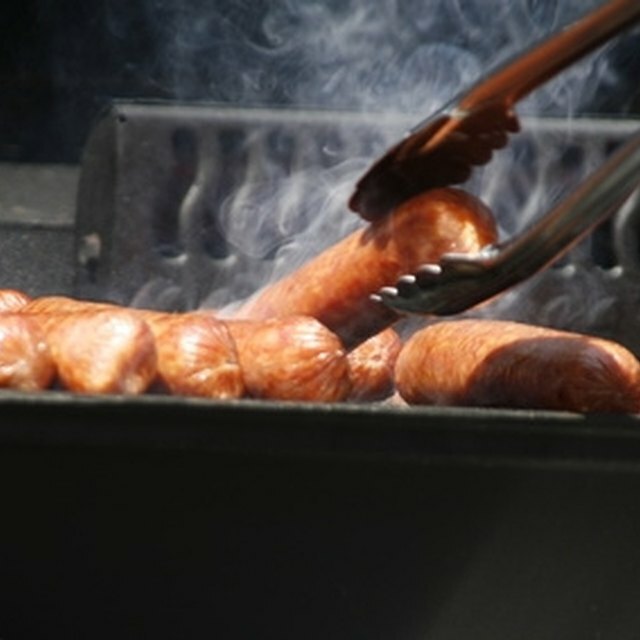 Rinse the inside of the grill and wipe it clean with paper towels or old towels. Install the new igniter kit. This will consist of screwing the igniter switch back into the front of the grill and running the black wire to the mounting position on the underside of the grill. A bolt and nut will be used to attach the igniter wire into place. Install the new burner tubes. For a three-burner grill, this will consist of a cross bar and three burner tubes. Place the center cross bar into place using the provided hardware. Slide the burner tubes into place of the old ones and secure each into place with the hardware provided with the replacement kit. Connect your three-burner tubes to the center cross bar. Reattach your propane tank and turn it on. Test the assembly of your new grill guts by starting the grill and allowing it to burn for a few minutes. Inspect the connections to ensure the gas is flowing properly. If you see flames shooting from anywhere except the burner tubes, turn off the grill. Allow it to cool and tighten the connections. Place the new porcelain grill grates and allow the grill to burn on high for 30 minutes to remove the new smell. Other parts also can be replaced and added to your grill. See the website of your grill's manufacturer for a list of replacement parts and accessories available. Keep your grill clean and covered to make it last for a long time. When working with propane, be sure to take all precautions. Shut off the tank and remove it from the grill before beginning to disassemble the grill.